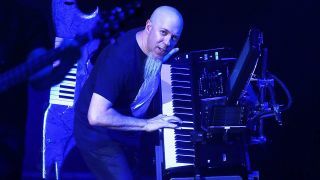 Dream Theater keyboardist Jordan Rudess has launched another music app for iPad. GeoShred is the latest in a series of software releases he’s put out on Apple’s tablet under his company Wizdom. Rudess says: “’Im very excited to present my new app, GeoShred – my go to musical instrument for extreme riffing. The app allows users to create realistic guitar effects and edit the results by bending, stretching and manipulating the sounds. Earlier this year, Rudess praised Apple, saying the iPhone and iPad had inspired him to explore the possibilities of touch-screen technology. Dream Theater recently revealed details of their 13th album The Astonishing, which is set for release on January 29. They’ll kick off their European tour in London on February 18.